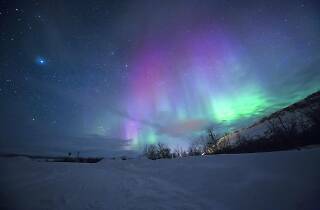 Aurora borealis, commonly known as the northern lights, is one of nature's rarest and most beautiful phenomenons. In North America, the elusive pastel-colored skies can be viewed in northern regions of the continent—like Canada and Alaska—but due to an abnormal geomagnetic storm, Chicagoans may be able to see them on Saturday night. The "storm," which is expected to reach Earth on Saturday, is scientifically known as a coronal mass ejection (CME), a.k.a. a giant cloud of charged particles that originates from the layer of gas surrounding the sun. 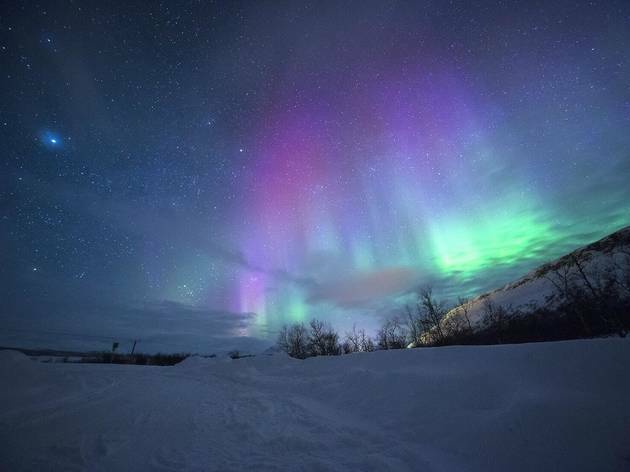 According to the National Oceanic and Atmospheric Administration, the CME could temporarily strengthen the scope of the northern lights, making it possible for Chicagoans to gaze up and see the stunning natural phenomenon. Don't get your hopes up just yet: As with any cosmic occurrence, the northern lights are incredibly unpredictable, says Michelle Nichols, the director of public observing at Adler Planetarium. The technicolored light show may not reach Chicago at all. "There's no one place [or time] we can tell people to look, there's no one place we can tell people to go," says Nichols. "If you want to take a chance, go far from the city, where you're farther away from light pollution." Nichols adds that even if the northern lights are visible, they won't have their famous green curtain structure you've probably seen in photos. Due to how far south Chicago is from the North Pole, they will instead appear as a general glow, which can be hard to distinguish from light pollution. You might not want to devote your entire weekend to tracking down the fabled phenomenon, but if you step outside on Saturday night, there's a chance you could be treated to an epic show. Marty is an editorial intern at Time Out Chicago. He loves naps like Kanye loves Kanye. Follow him on Twitter @uncle_morty_.